Fermented foods such as Kombucha, Kimchi, Apple Cider Vinegar, pickles, and Kefir are becoming increasingly popular because of health benefits and mainstream availability. The potential for digestive balance and good bacteria that these fermented foods present inspired a mass recipe development within Thomas Cuisine; we came up with dressings, pickled vegetables, brines, smoothies and beverages. Our chefs have loved this creative endeavor and wanted to share a downloadable shrub recipe for you to try this summer as a refreshing alternative to sugary sodas, juices, and adult beverages. The video below shows how your shrub can look and taste! In a large glass jar or bowl, combine the figs, blackberries, and sugar. Mash lightly, cover tightly, and let sit for twenty-four hours, stirring occasionally to dissolve the sugar. After 24 hours, add the vinegar and chill for a few hours. After a few hours you can strain the mixture through a fine-mesh sieve, pressing on the solids to extract the liquid syrup leave the solids. The shrub can be strained and used at this point, but it will take on more of the characteristics of the fruit if it sits in the syrup mixture for a few days. The shrub will keep for up to at least a month, and probably longer. six ounces of fizzy water. Squeeze in a lime wedge, stir, and serve. Chef’s Tip: Want a fancier feel to your sparkling beverage? 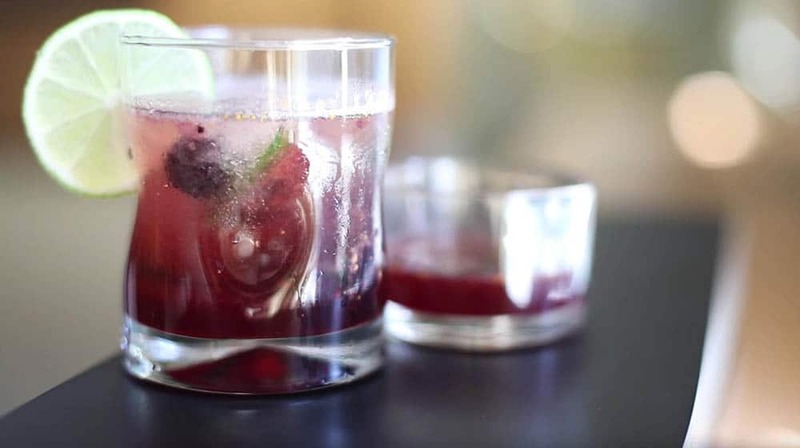 Try making fruit-infused ice cubes the night before, simply dice up a few bits of the same fruit that you’ll choose to use in your shrub, and toss it in an ice cube tray for natural flavor boost.